EDWARDSVILLE – Down 17-0 heading into the fourth quarter, the Wilkes University football team rallied to score 21 unanswered points in the final frame to post a dramatic come-from-behind win over visiting Stevenson University Saturday afternoon in a Middle Atlantic Conference matchup at Schmidt Stadium. With the victory, Wilkes improves to 3-4 overall and 2-4 in league games while Stevenson drops to 3-4 and 2-4 in conference contests. The Mustangs struck early taking the opening kickoff 74 yards on four plays capped off by a Marcus Holley 24-yard touchdown run to take a 7-0 lead in the first. Holley went in again, this time from five yards out to begin the second, as Stevenson led 14-0 through two quarters. After a Charlie Cornell 29-yard field goal was true to push the advantage to 17-0 to close the third quarter of play, Wilkes began its furious comeback in the final stanza. The Wilkes defense forced a three and out and 43-yard punt to setup the Colonel offense at their own 26. Quarterback Taylor Young connected with Jonathan Conklin on a nine-yard pass to move the ball to the Wilkes 35. From there, Wilkes went to some trickery as wide receiver David Claybrook took a handoff sweeping around the left side heading for a rushing attempt. The rookie wide out broke free from a tackle and instead threw the football to a wide open Conklin who was running a fly pattern on the fake running play for a 65-yard touchdown to cut the lead to 17-7 with 13:09 on the clock. Wilkes went for an onside kick on the subsequent kickoff and Frank Bob’s squib kick worked as the Colonels pounced on the football before a Mustang returner could get to it. Wilkes was unable to capitalize on the turnover but continued to build momentum for later in the contest. Still trailing 17-7 with just over 2:30 left to play, Stevenson quarterback Zach Jefferson lost the handle on a handoff and Wilkes recovered at the Stevenson 34 looking to edge closer. Young found tight end Drew Devitt for a five yard completion to the Stevenson 34 and a personal foul penalty moved the Colonels down to the Mustang 14. Young then hit Conklin on a fade route to the left side of the end zone to inch the Colonels closer, 17-14 following a Jordan Fredo extra point. Wilkes went to the onside kick again, but this time Stevenson found the football and down the ball to keep possession. The Colonel defense came up big on the ensuing drive stopping the Mustangs at their own 49 and forcing a Stevenson punt. Wilkes would take over at its own 25 yard line with 1:04 on the clock and no timeouts left down three. From there, Young hit Claybrook on a crossing pattern for a 32-yard pickup down to the Stevenson 43. Another Young-to-Claybrook connection, this time for 39 yards, brought the Colonels down to the Stevenson one yard line with just :37 left in the game. Young went play-action from the one and hit Dan Curry to the right side on an out route to complete the Wilkes comeback as the Colonels led 21-17 with :24 left in the game. Stevenson had one last chance to tie or win the game on its final possession, but Tate Moore-Jacobs intercepted quarterback Zach Jefferson’s pass and ran out the clock to preserve the Wilkes victory. Young struggled to find his rhythm early, but finished with some key throws late posting 167 yards on 13-for-28 passing and two touchdowns. Claybrook went over the 100+ yard mark for the second time in his career finishing with five catches for 110 yards and one throwing touchdown. Conklin made four catches for 99 yards and two scores. 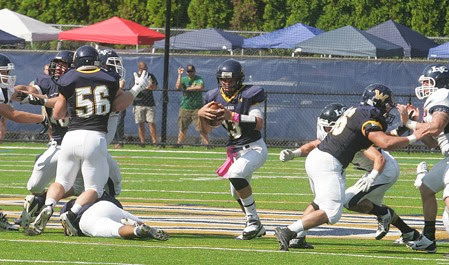 Pat Ingulli led the Wilkes ground game with 73 yards as the Colonels rushed for 140 yards in the contest. Moore-Jacobs led the defense with 10 tackles while Tyler Thomas enjoyed his best day for Wilkes this season adding 10 stops (1.5 tackles-for-loss). Holley led Stevenson with 165 yards and two scores on 19 carries. Jefferson finished 8-for-16 for 142 yards and one interception. 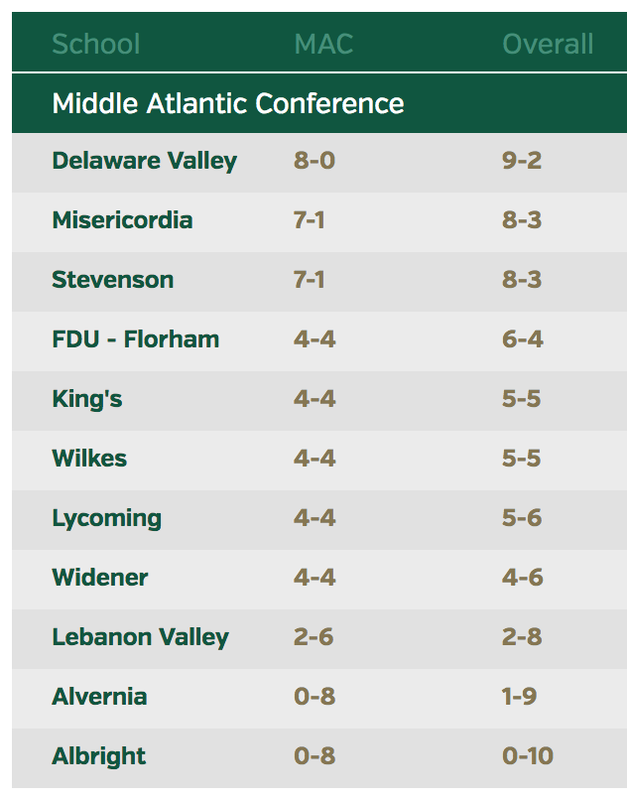 Wilkes takes to the road next Friday traveling to Madison, NJ to face FDU-Florham in an MAC matchup at 7:00 p.m. Head coach Frank Sheptock (16-0) has never lost to FDU-Florham in his career with the Colonels.